Arnold J. Isbell (DD-869) was laid down on 14 March 1945 at Staten Island N.Y., by the Bethlehem Steel Co. and launched on 6 August 1945, the day the US dropped the atomic bomb on Hiroshima, Japan. The Isbell spent almost her entire life in the Pacific fleet. She missed action in World War II but served in Korea and Vietnam. 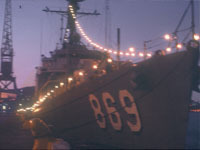 After her transfer to the Greek Navy in the early 1970s she continued to serve into the 1990s. This entry was posted on June 3, 2014 at 8:35 am and is filed under In the News. You can follow any responses to this entry through the RSS 2.0 feed. You can leave a response, or trackback from your own site. Nice framed pic of the ISBELL on ebay. My book about my time on the A.J. during the Korean War, The Second Truth, is now available in Paper back, Hard cover and E-Book anywhere books are sold. My father served on the USS Arnold J. Isabel as a Captain during the Korean War in 1942 to 1945 In 1945, he was honorably discharged due to an accident aboard ship in which he fell into the ship’s manhole during an attack and he suffered a traumatic spine injury and was in the hospital overseas before being transferred to a hospital in San Francisco, CA. My father was a member of the Masonic Lodge and he passed away in 2016.